Owlboy’s greatest achievement is how it has managed to stay relevant. Against the deluge of retro-inspired sidescrolling platformers that have been thrown at us over the past several years, Owlboy doesn’t just stand head and shoulders above its competition – it’s an outstanding example of how the genre can, and should, be done. Development started back in 2007, and while there are no obvious reasons as to why it took so long to reach full release – beyond its small development team and multiple iterations – it has done so looking and feeling remarkably polished. You wonder how Owlboy might have fared had it released into a world pre-Braid and the likes. Nonetheless, in 2016 it’s still a fine accomplishment. 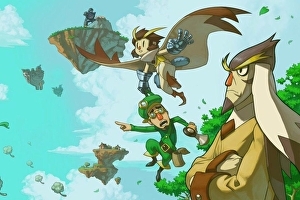 Owlboy’s charm is tied to its lead character Otis, as well as the host of friends and foes that pop in and out of this capricious coming of age tale. Few games have captured such wonderfully expressive body language and stirring facial expressions through pixel art, and as Otis is explicitly identified as a mute protagonist his silent interactions inevitably become all the more precious. As an owl in training, Otis spends much of his time trying to win the respect of his elders however but can’t seem to do anything right in their eyes in the game’s earliest stages. A typical tale of trial and tribulation unfolds that sees Otis dotting back and forth between dungeons and villages to further his ten-hour story and win over those who judge him along the way. Well-worn genre stereotypes do exist – something first embodied by Otis’ hard-shelled domineering professor and mentor Asio – however they all fit snugly in this world. The latter’s scalding of our seemingly misunderstood hero in the game’s opening scene leaves Otis with his head bowed, sweat running from his brow and twiddling his thumbs. I fell in love with him there and then. Otis’ first encounter with overexcitable best mate Geddy just moments later, though, allows Owlboy to confidently tease its wide-ranging emotive repertoire inside its first ten minutes, while also serving to introduce the value of its central mechanic: flight. Double tapping jump in Owlboy sends Otis skyward but – unlike the vast majority of games which include the ability to fly – he’s able to soar freely without being governed by stamina metres or restrictive timers.